WASHINGTON (CNN) -- More than one-third of all weapons the United States has procured for Afghanistan's government are missing, according to a government report released Thursday. 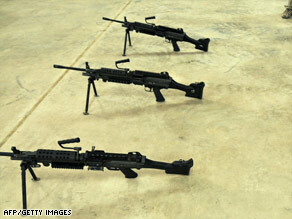 U.S.-issue M249 squad automatic weapons are shown at a camp in Kandahar in December. The U.S. military failed to "maintain complete inventory records for an estimated 87,000 weapons -- or about 36 percent -- of the 242,000 weapons that the United States procured and shipped to Afghanistan from December 2004 through June 2008," a U.S. Government Accountability Office report states. "Accountability lapses occurred throughout the supply chain," it says. The Defense Department spent roughly $120 million during that period to acquire a range of small arms and light weapons for the Afghan National Security Forces, including rifles, machine guns and rocket-propelled grenade launchers. The military also failed to properly account for an additional 135,000 weapons it obtained for the Afghan forces from 21 other countries. "What if we had to tell families [of U.S. soldiers] not only why we are in Afghanistan but why their son or daughter died at the hands of an insurgent using a weapon purchased by the United States taxpayers? But that's what we risk if we were to have tens of thousands of weapons we provided washing around Afghanistan, off the books," Rep. John Tierney, D-Massachusetts, chairman of the House Subcommittee on National Security and Foreign Affairs, said at the start of a congressional hearing on the report. The military is unable to provide serial numbers for 46,000 of the missing 87,000 weapons, the report concludes. No records have been maintained for the location or disposition for the other 41,000 weapons. The report urges Defense Secretary Robert Gates to "establish clear accountability procedures for weapons while they are in the control and custody of the United States" and direct those "involved in providing these weapons to track (them) by serial number and conduct routine physical inventories." The GAO review comes as numerous senior officials -- including President Obama -- are expressing serious concern over the deteriorating security situation in Afghanistan. On Wednesday, eight Taliban suicide attackers struck Afghan government buildings and a prison in Kabul, killing at least 19 people in a coordinated attack that the Taliban said was in retaliation for the mistreatment of prisoners, according to Afghan officials. The attacks raised new questions over the effectiveness of the ongoing $16.5 billion U.S. effort to train and equip Afghan security forces. Officials from the State and Defense departments intend to request an additional $5.7 billion in assistance for the Afghan army and police in fiscal year 2009, according to the report. The Obama administration is conducting a top-to-bottom review of U.S. policy toward both Afghanistan and neighboring Pakistan. The president will likely make a decision on sending additional troops to Afghanistan "in the course of the next few days," Gates said Tuesday.